Sizing down, moving up or away requires a lot of planning. Deciding to purge prior to moving has its definite benefits. Everyone is different in planning and organizational skills, but there is one thing for certain; when a property is sold, every single possession the owner has, inside and out, must be dealt with before closing day. On the proficient end of the moving spectrum are people who live a very minimalist lifestyle. They could fit all of their worldly possessions in a couple of moving boxes. On the other, there are those who have kept every single thing that they have ever come into possession of. Sometimes these people feel great sentimental attachment, other times they feel there’s financial value or perhaps believe that “someday” they might use it. Most people fall somewhere in between. “Decluttering” and “purging” are not just a buzz words used when we’re getting homes ready to sell. Removing unwanted, unused items from living spaces can be liberating; getting rid of those little figurines that you picked up from your dearly departed Grandma’s house a few decades ago can go a long way making you realize that you really don’t need the whole collection to remember her; one special piece afforded its own spot in your new space may suffice. Purging can be an invigorating experience. Keeping your home free from unwanted, unused “stuff” is a never-ending job. The fact is unwanted stuff costs us money. First of all, if it’s out in the open, we have to spend our time keeping it clean; we offer up prime storage space if it’s in a box in our closet or basement. Secondly, when it comes time to move, packing, moving and unpacking things that you don’t like or need is a waste of time and money- adding to the physical and financial stress of moving. Go to a garage sale; take a look around. Glassware, figurines, china, cups, old furniture. Every year, thousands of people who are getting ready to move will haul stuff out onto their front lawns and driveways thinking that someone is going to buy it from them. After spending 6 or 7 hours watching people sort through their worldly possessions ( or at least the possessions they’ve decided to part with) they haul the majority of it back into their house. At that point they either proceed to pack it for the move, try to give it away or as a final resort, throw it in the garbage. What starts out with visions of making thousands of dollars ends up with the cost of hiring the local junk removal company in a wild effort to get rid of stuff prior to closing. 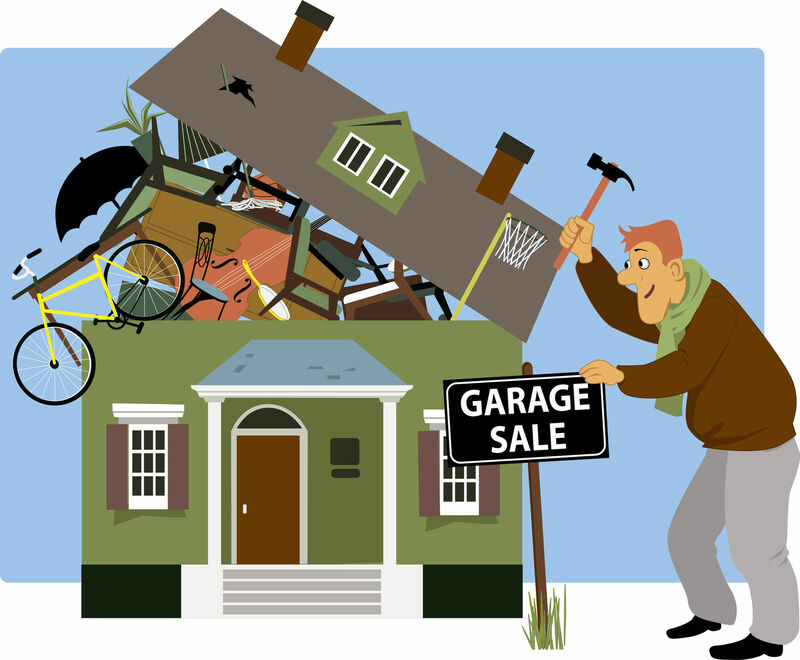 Many homeowners often vow that they’ll never have another garage sale for the rest of their life; a garage sale is a reality check to many- used stuff sells for pennies on the dollar and some stuff can’t even be given away. If you’re clearing out a house full of expensive collectables and antiques, it’s probably best to call in an auctioneering firm or antique dealer that knows the market for the items you have. You may not be thrilled with the value or offer they give you, but when you consider the time and effort involved in disposing of everything piece by piece, it may be in your best interest to let them buy the whole lot. If you’ve been able to make the “emotional” decision to move, you’re more than capable of getting rid of mismatched glasses & dishes in your cupboards, clearing your table tops of items you no longer want or need or tossing the contents of those boxes that have sat for a decade, unopened in your basement. Top 5 items to purge prior to moving. It’s certainly not the most environmentally friendly thing to do- but trash them. Throw them out. Glassware is not recyclable in most areas. Thrift store shelves are full of glassware and the fact is most people who shop at thrift stores are looking for “sets of glassware” If you don’t have at least 4- toss them. To move them would mean that you’d have to pack them, mark the box fragile and then try to find a new spot for them at your new place; probably packed in the box in your basement. Do yourself a favour- trash them in your regular garbage. Normal everyday dishes? Same thing as for glasses. Single, cracked, chipped, heavily worn or broken sets? Thrift store shelves are lined with sets of nice dishes- they’ll probably end up tossing the chipped, broken and worn dishes in the garbage. Unless you have at least 4 of any one item- trash them. Put them in a heavy garbage bag and hit them with a hammer to spread the weight. If you can’t bring yourself to doing this, put them on a stand at the end of your driveway with a free sign. If they don’t go- get the garbage bag and hammer out. You’ll save yourself a lot of time, effort and money. Good china, bone china and pottery are different. You may want to take it to your local consignment or antique store or sell it online. There is a market out there for people looking to either extend their set of china or replace broken pieces. Many china patterns are discontinued and people are actively searching to expand their sets or make them whole again. Check them over. If there are no stains or signs of wears, donate them to the thrift store. People don’t need a full set of sheets. Towels? unless it’s a beach towel, do not pile a bunch of mismatched towels into a box and trot them off to the second hand store-there are enough sets of towels donated that the single towel in your box will be tossed into the garbage. Everything over 2 is ok- if you have 2 or more towels of the same pattern or colour- wash them, bundle them together nicely and put them in a donation box. Someone will buy them at the thrift store. Table cloths: Make sure there’s no stain or wear. If there is, toss them, regardless if it was hand made in Belgium and given to you by Aunt Bertha 20 years ago. Antique pieces are especially difficult to part with. For some strange reason we’d rather have them collecting dust in our basement than ever allow them to continue their life in a home where someone truly loves them. If you just have it because it’s an antique or belonged to a departed relative, yet you don’t have a use for it, try to bring yourself to finding a new home for it. If you’ve decided to buy new furniture for your new digs, and assuming that your existing furniture is in good shape, you’ll have to either sell it or give it away. Sure, your kitchen set may have cost you $1000.00 when you purchased it, but don’t hold out hopes of reclaiming your investment. Remember that often when people are buying used furniture or accepting donations, it’s because they’re looking for something that’s in good shape and affordable. They’re usually not looking for a tattered sofa or broken kitchen set. Donating to one of your local housing charities is always a great thing and in the long run may save you a lot of time but don’t be surprised if they don’t want furniture that isn’t in good condition with all the parts and no hard wear. Most cities have programs where they’ll pick up large items at curbside. If it’s worn, tattered or broken drag it out to the curb sooner than later. This is a biggie: ask yourself a question. “Am I a collector?” If the answer is yes, then ask yourself where in your new home are you going to keep your “collection”. If you can’t think of a spot to keep your collection, then chances are you didn’t answer the first question correctly. Collectors love what they’re collecting. Most aren’t just collecting with the thoughts that some day they’re going to reap financial gain from their collection- it’s a passion to a true collector and their collection has a special place in their home; often their entire home. In this day and age, unless it’s extremely rare, its true value may shock you. Because of advancements in manufacturing, there are very few “post war” items that are “extremely” rare. “Collector” items are now mass produced for the pleasure of the “Collector”, with the highest value when they are originally manufactured. For example, an original Cabbage Patch Doll that cost $115.00 and a battle at the store 30 years ago can be bought on many online auction sites for $40-$50.00. If you have a prized “Collectors Item” in mint condition, in its original box, perhaps there is value, but if it’s been used or the box is nowhere in sight, chances are it’s not worth what you think it is. Now, you must do the hardest thing. Assess your time. Do you have time to list each the items that you may think is a collectable online and then entertain numerous phone calls and emails for $10, $20 or even $100.00 or will you be better served to pack them all up and take them to the thrift store unless you’re lucky enough to be able to give them to friends or family. If you’re really insistent on getting money for them, do yourself a favour and sell them as a package. i.e.) Tea cup collection: variety of 20 cups and saucers. That way you’ll maximize your time and only have to deal with one ad and if you’re lucky, one buyer. I have now come to realize that if I really disliked someone, I should give them a nicely framed picture of them and me. Pictures are very interesting indeed. What Grandma or Grandpa doesn’t enjoy a nice picture of you and the kids? Especially one of those giant wall hangings with a hundred pictures showing your summer activities. Do not fall for the picture trap. Take a look at your personal picture collection. The ones on the wall, the table tops, the desk, the dressers- take a close look at them and try to figure out how they’re going to fit into your new house. Now is the time to set yourself free and thanks to technology, it’s easier than ever. Store them on a USB stick, the cloud, your hard drive and then display them on a picture viewer or play them as your screen saver. Think of making a special area on a wall or table for family pics. Make them special ones and keep it contained. You many want to transfer the pictures of your son or daughters’ wedding from 10 years ago out of their frames to a photo box or album. Often it’s the beautiful frame that keeps us from performing this harsh act- but don’t let it. If you have a use for the frame, then pack it to go. If you don’t- sell them as a bunch of frames online- there are lots of crafts people who use frames or you can donate them to a thrift store. Whatever you decide to do, make the decision “NOT” to take them with you and store them forever in your basement. Regardless if you’re trying to make your house more organized or getting ready to make a move, clearing your space in a time and cost efficient manner is key. When you’re moving, you’re often working within a very tight timeframe. Moving boxes to your new home full of items full of things that you will never use is a waste of time and money. If you’re not moving and simply decluttering, tossing the bad and donating the good will probably prove to be the most time and cost efficient thing you can do. This entry was posted in Moving and tagged decluttering, Donna Bacher, garage, Hamilton, moving, purging, real estate, sale by Donna Bacher, Broker. Bookmark the permalink.